The best frappe you will find anywhere! A frappe is a blend of milk, syrup, and ice cream. In other parts of the country this is known as a milk shake. 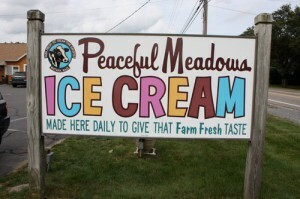 A milk shake in New England is a frappe without ice cream – a cup of flavored milk. Many people order “shakes”. We think they mean a shake as available in the fast food places, something like a fribble or an awful awful, or something with candy mixed in. These are usually made with ice milk – we have them! They are called Yogurt Blenders and Low Fat Shakes. Frappes are available in Coffee, Chocolate, Strawberry, Black & White, Mocha or any ice cream flavor you’d like! Available in regular, extra thick or malted. We also feature Lite Frappes – made with ice milk, fat free syrup, and skim milk available in Vanilla, Coffee, Chocolate, Strawberry, Black & White and Mocha. We take a Generous Scoop of our own Low Fat Yogurt, whip it with skim milk, no fat fruit or other flavoring, & churn out a delicious treat! Banana, Vanilla, Chocolate, Pineapple, Coffee, Blueberry Peach, Strawberry, Mocha. Available in Regular or Large. Ice Cream Soda – Vanilla, Coffee, Chocolate, Strawberry, Root Beer Float. Sherbet Freeze – Available in Orange all the time. Watermelon is featured in the late spring and summer. Razcranberry is available autumn through spring. ICE CREAM CAKES – We’re happy to write your special message on any cake. Cake for 8! 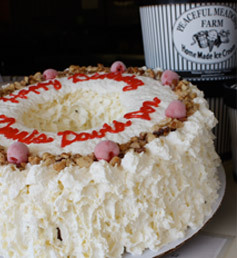 Available in Vanilla & Chocolate or Vanilla & Strawberry this ice-cream cake will serve up to 8! Double the dose with a delicious ice-cream cake that serves up to 16! A Mocha Mud cake is made with coffee & chocolate ice cream, frosted with chocolate whipped cream, Oreos and cherries. We have Mocha Mud cakes on hand to serves 8 or 16. A larger cake, to serve 24, may be ordered with 24 hours notice. Your choice of flavors is available with 24 hours notice. A cake to serve 24 is available with 24 hours notice. All items/flavors are not all available in all stores. Prices subject to change. Massachusetts meals tax and local tax will be added as applicable. Product and prices may vary by store. Our products are made in a facility that processes nuts and/or peanuts and may contain fragments of nuts and/or peanuts.